I love this flavour combination so much that I’m planning to dedicate 2 big flower pots in my garden this summer to growing tomatoes and basil and I can’t wait. These two plants are a match made in heaven, even in the garden…they’re perfect companion plants that help each other grow. When I plant them side by side I get the best basil in the world! 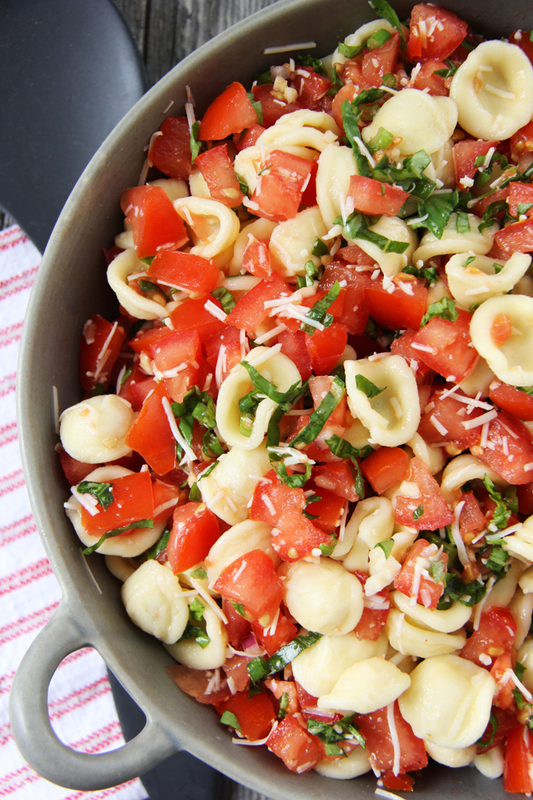 And that means plenty of bruschetta, goat cheese tarts, Caprese salad, and this bruschetta pasta salad. Hello summer. So let’s get back to this pasta dish, shall we? This dish is fresh and very easy to put together. 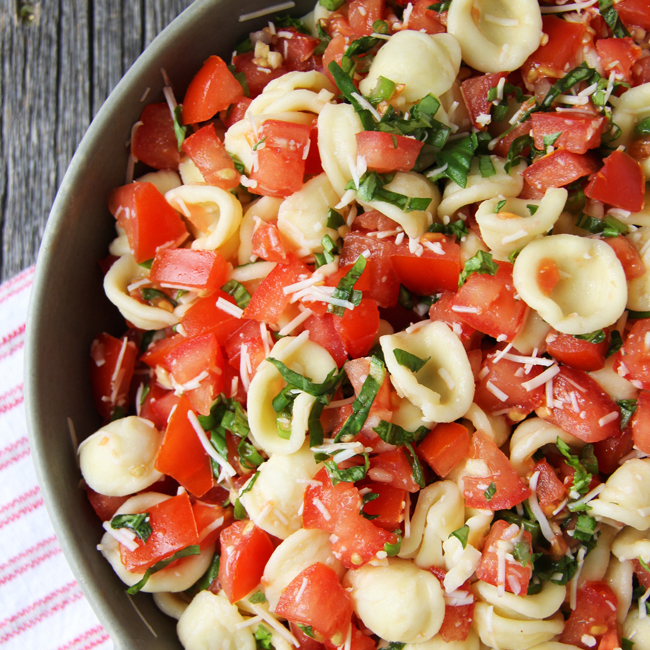 For this pasta salad the noodles, tomatoes and basil are tossed with olive oil, a little balsamic vinegar, some parmesan cheese, then seasoned with salt and pepper. Just simple and delicious. And you can use any kind of noodles that you like for this dish, I just happened to have some orecchiette noodles around so I used them. I liked how the shape of the noodle held the bruschetta so you had a mouthful of flavour in each bite. 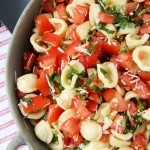 In a bowl, combine the tomatoes, onions, garlic, chopped basil, olive oil, balsamic vinegar and parmesan cheese. Let this mixture rest for at least 15 minutes. Then toss the tomato mixture with the cooked noodles. You can serve and enjoy this recipe right away, or let it rest for up to an hour before enjoying! 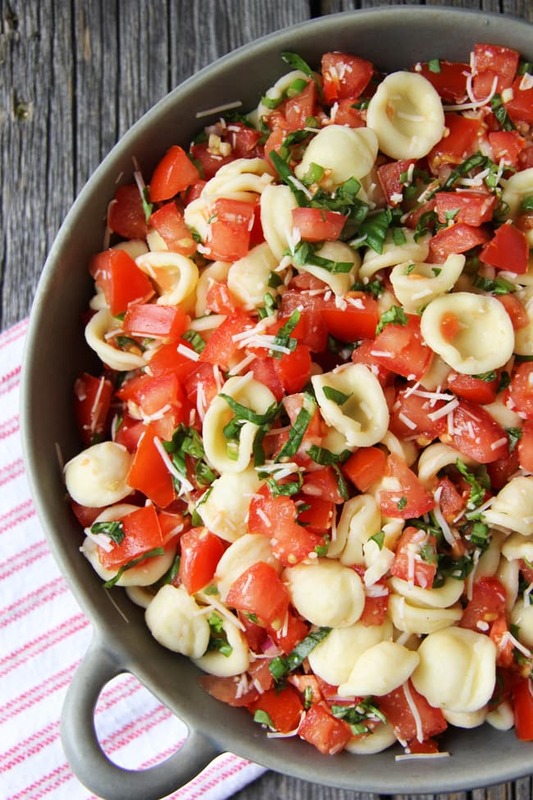 0 Response to "Bruschetta Pasta Salad"